An Appreciation, Checklist of Dissertations and Publications1↤ 1. The authors wish to thank Clare Bond, secretary for the Centre for Eighteenth Century Studies, University of York, for her assistance with this note. In 1998 John Barrell, director of the Centre for Eighteenth Century Studies at the University of York, invited Michael Phillips to design and teach a one-year interdisciplinary MA in English and History of Art devoted to the life and work of William Blake. The course, William Blake and the Age of Revolution, was first convened in October 1999. Michael’s hands-on investigations into Blake’s printmaking methods and research into the creation of the Songs of Innocence and of Experience and Blake’s life in Lambeth during the 1790s focused the course sharply upon how the illuminated books were produced in their immediate biographical and historical contexts. During the first term, we concentrated on Songs of Innocence and Songs of Experience. This involved exploring the conception and evolution in manuscript of Blake’s poems and designs and the development and mastery of the method he used to reproduce them in “Illuminated Printing.” In the second term, we explored Blake’s life and work in Lambeth during the first half of the 1790s, situating him in a detailed historical context. One seminar, composed of a multimedia presentation detailing Michael’s reconstruction of Blake’s residence, studio and neighborhood in Lambeth, had a profound influence on several students’ methodologies and the topics they later researched for their dissertations. From the beginning, emphasis was also placed upon introducing students to museums, galleries and libraries in preparation for primary archival research. With some variation from year to year, these included the National Archives (PRO), British Library, British Museum Department of Prints and Drawings, Lambeth Archive, City of Westminster Archives Centre, London Metropolitan Archive, St. Bride Printing Library, Tate Britain, the Fitzwilliam Museum, Glasgow University Library, Hunterian Art Gallery, the Edinburgh Printmaker’s Workshop and the Black Star Press. These field trips soon paid dividends, providing a unique opportunity to examine original materials firsthand, including Blake’s manuscript Notebook and the manuscript of Vala or The Four Zoas, multiple copies of the illuminated books and separate prints, as well as manuscript and printed materials relating to the topographical, political and cultural contexts of Blake’s life and work. Several students vividly recall how, one bright December morning in Cambridge, there was a dazzling effect of sunlight reflecting off the gold material Blake used to finish each plate of the King’s College copy of Songs of Innocence and of Experience; others remember the visit to the National Archives at Kew and inspecting the huge folio register of political prisoners in Newgate 1792-95. One of the most valuable aspects of the course was our exposure to the practicalities of printmaking and eighteenth-century book production. During the initial years of the course, Michael provided demonstrations at York in an improvised printing studio at the King’s Manor. These were conducted using his own facsimile relief-etched copperplates of the Songs and America and an extremely rare nineteenth-century star-wheel rolling press. In later years, when the press was no longer available, students traveled north to Scotland where Michael conducted similar printmaking sessions at the professional Edinburgh Printmaker’s Workshop. These were unique, valuable, and at times frustrating experiences, highlighting the care and, more importantly, the time required to ink a shallow relief-etched plate in order to obtain even a relatively clean print.2↤ 2. See Michael Phillips, “The Printing of Blake’s America a Prophecy,” Print Quarterly 21.1 (March 2004): 18-38. The sessions complemented demonstrations and discussions with other experts in intaglio and letterpress printing. A day was spent engraving, inking and printing intaglio copperplates with Anthony Dyson, professional printmaker, at his Black Star printmaking studio in Teddington. We enjoyed an afternoon in Soho with the eighteenth-century print dealer Andrew Edmunds, where we examined his extensive collection of James Gillray and other political caricatures. We also spent a day with Nigel Roche, a repository of knowledge concerning print culture in the eighteenth and early nineteenth centuries and curator of the St. Bride Printing Library and Museum off Fleet Street, who instructed us in printing from letterpress on a seventeenth-century wooden screw press. David Alexander provided valuable insights on Blake’s apprenticeship and later career in the context of contemporary fashions in printmaking. Exposure to these experts, grounding us in different forms of print culture, was exciting, informative and inspiring. 1. 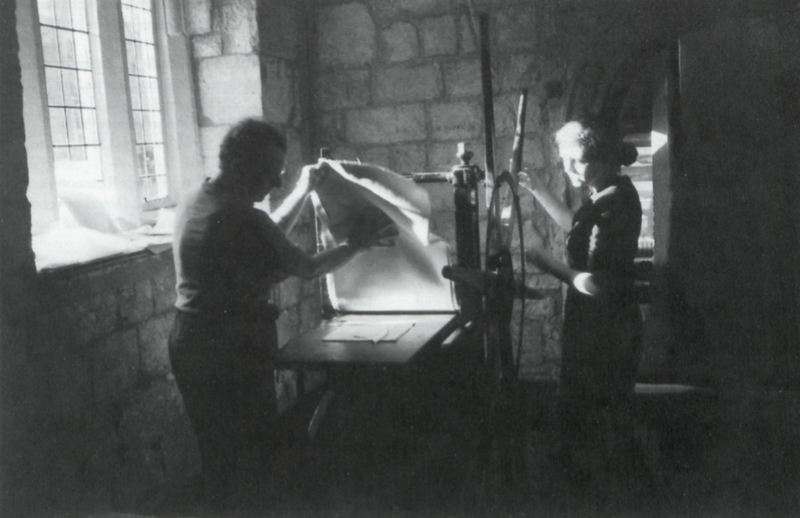 Rebecca Minnitt and Michael Phillips printing a relief-etched plate on a star-wheel rolling press, the King’s Manor, York, autumn 2000 (photograph by Troy Patenaude). the National Portrait Gallery of Scotland. Meeting specialists in the fields of paper conservation, miniatures, and painting materials further enhanced our understanding of Blake’s life, works, use of artistic techniques, choice of pigments, medium and media in the creation of his illuminated books and separate prints. From this solid theoretical and practical preparation, Michael encouraged students to make original choices in selecting the works and contexts they wished to explore in their two major essays and 15-20,000 word dissertation. The diversity and originality of the students’ choices are apparent in the titles of the dissertations listed below. William Blake and the Age of Revolution was also very popular with students as an optional module, where they would attend the course in either the first or the second term, and attracted students from the Continent and America as well as from Britain. As external assessor and examiner of the course, Andrew Lincoln, of Queen Mary College, University of London, generously gave of his time in writing reports on our essays and dissertations. On completing the course, five students went on to pursue doctoral studies in England or North America. A number of other students took up professional positions often not unrelated to their area of study, such as editor of children’s literature at the Cambridge University Press and associate editor of renaissance and eighteenth-century literature at the Arden Press and subsequently Oxford University Press. However, due to the small numbers of students taking the MA, it was decided that it should cease to be offered from the end of September 2004. The disappearance of this unique course has left a substantial gap in postgraduate Blake studies. At present, we understand that no other academic establishment offers a comparable interdisciplinary master’s degree course. It is to be hoped that a similar course may be convened elsewhere. Richard Angus Whitehead. “New Discoveries Concerning William and Catherine Blake in Nineteenth Century London: Residences, Fellow Inhabitants, Neighbours, Friends and Milieux, 1803-1878.” 2 vols. University of York, May 2006. Mark Crosby (with Jon Mee). “‘This Soldierlike Danger’: The Trial of William Blake for Sedition.” Resisting Napoleon: The British Response to the Threat of Invasion, 1797-1815. Ed. Mark Philp. Aldershot: Ashgate, 2006. Mark Crosby. “‘A Fabricated Perjury’ The [Mis]Trial of William Blake.” Journal of Legal History (forthcoming). —. “Manuscript Annotations Signed ‘WB’ in a Copy of Richard Bentley’s Edition of Paradise Lost (1732). Were They Written by the William Blake?” Book Collector (forthcoming). —. “‘The Sweetest Spot on Earth’: Reconstructing William Blake’s Cottage in Felpham, Sussex.” British Art Journal (forthcoming). Troy R. C. Patenaude. “‘The glory of a Nation’: Recovering William Blake’s 1809 Exhibition.” British Art Journal 4.1 (spring 2003): 52-63. Bethan Stevens, during 2004, compiled computer catalogue entries for the Blake collection of prints in the British Museum Department of Prints and Drawings, amounting to over 1,000 entries. (Entries for the collection of nearly 400 drawings had been completed previously.) The catalogue is currently available only at the museum, but will go online in two or three years’ time. Based upon the collection, her introductory book, William Blake, was published by British Museum Press, October 2005. Angus Whitehead. “‘William Blocke’: New References to Blake in Boyle’s City Guide (1797) and Boyle’s City Companion (1798).” Blake Journal 8 (2004): 30-46. —. “A Reference to William Blake and James Parker, Printsellers, in Bailey’s British Directory (1785).” Notes and Queries ns 52.1 (March 2005): 32-35. —. “‘But Kitty, I better love thee’: George Richmond’s Annotation to Song [I Love the Jocund Dance] in Volume II of Gilchrist’s Life of William Blake (1863).” Blake Journal 9 (2005): 87-97. —. “William Blake’s Last Residence: No. 3 Fountain Court, Strand. George Richmond’s Plan and an Unrecorded Letter to John Linnell.” British Art Journal 6.1 (spring/summer 2005): 21-30. —. “‘I also beg Mr Blakes acceptance of my wearing apparel’: The Will of Henry Banes, Landlord of 3 Fountain Court, Strand, the Last Residence of William and Catherine Blake.” Blake/An Illustrated Quarterly 39.2 (fall 2005): 78-99. —. “New Information Concerning Mrs Enoch, William and Catherine Blake’s ‘Fellow Inhabitant’ at 17 South Molton Street.” Notes and Queries ns 52.4 (December 2005): 460-63. —. “A Quotation from Lord Byron’s The Two Foscari in William Blake’s The Ghost of Abel.” Notes and Queries ns 53.3 (September 2006): 325-26. —. “William Blake’s Subsidiary Design of a Dog in His ‘Heads of the Poets’ Tempera of William Cowper (c. 1800-1803): An Identification.” Notes and Queries ns 53.3 (September 2006): 316-20. —. “The Arlington Court Picture: A Surviving Example of William Blake’s Framing Practice.” British Art Journal (forthcoming). —. “‘This extraordinary performance’: William Blake’s Use of Gold, Silver and Other Metals in the Creation of His Paintings and Illuminated Books and a Possible Source of Blake’s Metal c. 1821-27.” Blake/An Illustrated Quarterly (forthcoming). —. “‘Visions of Blake, the Artist’: An Early Reference to William Blake in the Times.” Blake/An Illustrated Quarterly (forthcoming).